Why can't I use my family, friends or bilingual workers to interpret for me? Why can't my child interpret for me? The Department of Health has developed the video below to increase staff awareness of the need to identify and facilitate timely patient and client access to professional interpreter services. Further information about engaging interpreters is under the video. When should an interpreter be engaged? How do I identify if an interpreter is needed? Why do I need to work with accredited interpreters? What do I do if someone refuses the offer of an accredited interpreter? What are the risks of communicating through unaccredited interpreters? Why can't I use my family or friends or bilingual workers to interpret for me? Queensland Health policy is to use interpreters who are NAATI accredited or recognised. confidentiality standards may not be met. incorrect use of medications or attention to treatment details. Given this, family and friends can be used only in very limited instances where there is no on-site or telephone interpreter available. Situations where this may occur could include medical emergencies. Family and friends may be used for simple, day-to-day communications. Children are not appropriate interpreters in any circumstance. This is because of the same reasons that family and friends cannot be used as interpreters (refer above). Using children as interpreters has the additional problem of potentially upsetting the authority relationships in the family. An interpreter is someone who conveys an oral message or statement from one language to another. A translator is someone who conveys written messages or statements from one language to another. 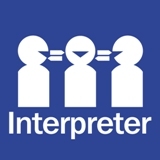 An accredited interpreter should be engaged when the information to be communicated is significant for health and/or health outcomes, the person has a Queensland interpreter card, the person requests an interpreter, or the person’s English language skills are assessed to be inadequate for the situation. discussions concerning patient status, health insurance and accounts for services. An example of a situation where an accredited interpreter is not required is during routine and ongoing renal dialysis. Interpreters may be requested by reception and administration staff and staff providing direct health service delivery. Interpreters may also be requested by management or staff undertaking community engagement or health promotion/community education. Ask a question that requires the person to answer in a sentence. Avoid questions that can be answered with a yes or a no or a familiar question such as Where do you live? Ask the person to repeat a message that you have just given in his/her own words. Remember - the interpreter is there to enable you to do your job competently, not only for the client. If you decide that an interpreter is required, you will need to discuss this with the person prior to arranging the interpreter. Consider engaging a telephone interpreter for this. Working with accredited interpreters ensures that you communicate through a trained, bilingual person, who is guided by a code of ethics, respects the confidentiality of the person, is impartial, accountable and strives for accuracy. Working with an accredited interpreter should not only meet the client's needs, but also your duty of care obligations to understand and be understood by people receiving a health service from you. Health services must consider the potential legal consequences of adverse outcomes when using unaccredited people to ‘interpret’ if an accredited interpreter is available. Many people in the community are not aware of their right to access an accredited interpreter and may be unfamiliar with using accredited interpreters when accessing health services. communicate that you have an obligation to ensure effective communication through the use of an interpreter when required (e.g. duty of care, quality and safety). It is preferable for an interpreter to be there for at least the first session. However, if this is refused, an interpreter should be renegotiated at the next appointment/meeting. The reasons why people may refuse the offer of an accredited interpreter are many and varied and may relate to the level of comfort or trust an individual (participating in an interpreting session) has with an accredited interpreter. Sometimes refusal can be due to the person and interpreter knowing each other, particularly those who are members of small communities. Other reasons may include that the interpreter may not speak the same dialect (e.g. Egyptian Arabic rather than Sudanese Arabic), the interpreter being viewed as the wrong gender, or to have political or religious affiliations do not sit comfortably with the client. Confirmation to use the interpreter service must be obtained from the client. Use of a telephone interpreter may be required to confirm acceptance and/or refusal of the service. If a person indicates a clear preference for not using an accredited interpreter this should be clearly documented on Patient Progress Notes in their Medical Record or other relevant documentation. complaints and even litigation if accredited interpreters are not used. Staff must consider the potential legal consequences of adverse outcomes when using unaccredited people to ‘interpret’ if an accredited interpreter is available.